Imagine a clear night sky, completely devoid of all extra ambient light, where the only thing between you and the stars is your telescope. The feeling is almost magical as you see starts you may have never seen before. It gets even better if you can get a good view of the constellation you’re zooming in on or the planet that happens to be visible to the naked eye. 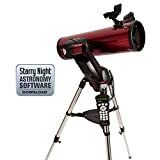 The question remains, how do you know what to choose if you’re a beginner and you’re trying to find the best telescope you can afford? First things first, let’s lay down some ground work, so you know what you’re looking at before making the decision. There are three different types of telescopes available for you to purchase, but within each of these three, there are other differences that need to be taken into account, too. The refractor telescope is the type of telescope that uses a lens to focus the light that is being received from the end of the lens. A reflector telescope uses mirrors to focus the incoming light and tends to work fairly well depending on the light conditions. The final type is the catadioptric telescope. That telescope is designed using a combination of both the mirror and the lens to pull the light in for you to be able to see the stars above. Binoculars are also a great starting point when you decide you want to go stargazing. A good set of binoculars will let you see quite a bit, plus you can use them in other ways, too. When you’re finally ready for some real star gazing complete with a telescope, start researching what is available on the market to make the best decision possible. Aperture is king when it comes to telescopes. The aperture refers to the size of the lens. A bigger lens means that you’ll see brighter and sharper images from your viewpoint. Dobsonian-style telescopes are great choices as they usually have larger apertures and are also easy to use. Keeping the type of mount in mind is also important in making your choice. The altazimuth mount is great for smooth movements when you’re adjusting your telescope. Dobsonian mounts are similar but are better for more advanced viewing. Equatorial mounts are different from altazimuth and Dobsonian mounts in that they have slow motion controls to follow objects in the sky. 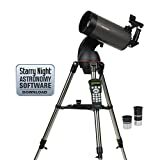 These are best for those that are more advanced in their stargazing or if you are attempting astrophotography. Also, keep your expectations realistic. What that means is that you need to choose the right kind of telescope for your needs. You can’t reach for the cheapest telescope and expect incredibly bright and crisp imagery that you can take pictures of because that’s entirely unrealistic. At the same time, that doesn’t mean you need to spend a small fortune to get a quality telescope. You can find some good ones for $200 or less. They go up from there, so be sure to do your research so you can be sure you get the best your money can buy. As you research your telescopes, you’ll find that there is a massive range in price for the best beginner telescopes that are out on the market. Some are as inexpensive as $ USD while others reach up to $$$ USD even for the amateur telescopes. Consider, too, that some of the best beginner telescopes are made for kids, hence the lesser price tags. If you’re looking for a kid-sized telescope, then some of them make fantastic choices. If you’re looking for something suited for an adult, you’re likely going to pay at least over $200 at a minimum. It’s no secret that kids love the stars. These telescopes bring them close enough to feel like you could touch them! The size of the reflector on this telescope is pretty good for a smaller telescope. It’s sturdy, too, which makes it great for small hands to use. The Orion FunScope also uses a red-dot sight to make things easier to find in the night sky. Although it is made to be child-friendly, it is not a toy. The mirror collects plenty of light, and the focal length allows viewers to enjoy seeing planets up close. Inside the telescope kit, you’ll also find two eyepieces at varying strengths to increase magnification anywhere from 20x to 50x. You’ll see a star map, too, that will help you and your kids get to know the night skies. The Meade Polaris is a refractor telescope that is perfect for a young beginner. The telescope includes three different eyepieces rated from low to high magnification levels. There is also a red-dot finder to help find the constellations or whatever else you’re trying to find in the sky. The telescope is mounted on a tripod which makes it stable and also easy to move as the skies move overhead. As a bonus, because refractor telescopes do not require much in the way of maintenance, these are easy to care for, which is something parents will love. The Celestron SkyProdigy is on the pricier side, but the reflector telescope is well worth its price thanks to all the bells and whistles you’ll find on this model. Once you turn it on, you can use the onboard computer to align the telescope in the direction you want to turn it. Plus, there is an internal camera that can take pictures of the sky. These pictures can then be analyzed on your computer to figure out the position of the night sky relative to where you are. Even more exciting is the way that once the telescope is fully aligned, you can target nearly four thousand different objects by simply pushing a button. You don’t need a star chart for this telescope, and you’ll still be able to see plenty of amazing celestial bodies with out any difficulty. This backyard telescope is a smaller version of the SkyProdigy, but it costs more. Go figure. Although the price is no small wonder considering the telescope has an onboard tracking system, and can locate up to 40,000 different celestial bodies with the touch of a button. 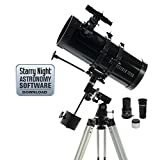 If your child is a little more serious about star gazing, this is an amazing telescope to use as it also works well in doing astrophotography when connected to a compatible camera. Dobsonian telescopes could be considered the gold standard in telescope design. Orion is also known for its quality telescopes, so this one is a great bet for you and your children. The design is much more simplistic than the Celestrons mentioned above, but the image that is produced at the viewer is bright and sharp. With the telescope, you’ll get three eyepieces and a different lens to allow you to explore the skies at varying strengths and magnifications from 70x to 240x. There is also an EZ Finder II on board to make aiming at your focal point easy to do. Adults have different expectations from kids, and while the child-friendly telescopes are nifty in their own right, there are some fantastic options for adults, too. The 127 SLT is more expensive than most other beginner telescopes, but you’ll love what you get for the money. It is a computerized telescope, much like its smaller counterparts mentioned previously, but are capable of finding more items in the night sky. One of the best reasons to start out with a computerized telescope is because by taking advantage of the onboard tracking system, you’ll be well on your way to finding things without the frustration that typically accompanies a novice. 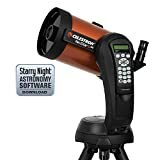 Yes, it’s another Celestron telescope, but this one comes in at just under $200 USD which is a steal for most of these telescopes. It might not be as powerful as its computerized counterparts, but it’s still a great telescope if it’s what you can afford. Set up is simple, too, and you can still zoom into planets and other things up to 300x magnification. You’ll also get a couple of eyepieces and TheSkyX software package to get you on your way to tracking the stars. This telescope is a solid Dobsonian telescope, and you won’t be disappointed when it arrives at your doorstep. The eyepiece does stand fairly high off the ground compared to others, but it’s the perfect height for most adults. If you intend to let children view, too, you’ll probably need a step stool. Longer than some of the other telescopes you’ll find, the reflector inside of this telescope will give you bright and sharp images of whatever you choose to focus on as it collects lots of light. Combine your use with TheSkyX software package, and you’re set for all sorts of stargazing. 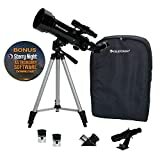 If you are a traveler and want to be able to enjoy the night skies during your journeys, this telescope is a wonderful telescope to take with you. 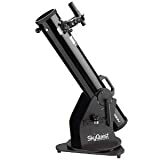 Inexpensive and convenient, this mobile telescope makes it easy to see open skies in unusual locations when you just can’t drag your giant Dobsonian telescope with you. It comes with a tripod and a carry bag. You’ve likely noticed the Orion name several times on this list, but there’s a good reason for it. Orion telescopes are solidly built, and you know quality goes hand-in-hand with their reputation. Complete with a 4.5” aperture, two extra eye pieces, and the Starry Night software, beginners can learn how to navigate the stars with ease. It is easily portable if you want to set it outside on your porch or on your deck, but if you want to go out into a field, it might prove to be difficult since there aren’t any wheels on this model. Selecting the best beginner telescope for children or adults can seem daunting when you’re not familiar with the different telescopes that are out there. Just remember that cheapest is not always best and neither is the most expensive. You can even find places that host star parties to find stargazing aficionados that will help you along your astronomical journey. These people are professionals, advanced hobbyists, and novices like yourself, so you’ll be in good company. Do your research, read reviews, keep your expectations realistic, and talk to people that are familiar with stargazing. You’ll figure out which one is best for you, and you’ll be visiting the stars for yourself in next to no time.